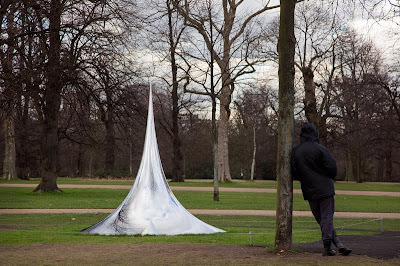 Another Anish Kapoor sculpture in Kensington Gardens. The spire reflects itself if you stand a few feet back from it. Just thought what this remined me off and it isn't totally alien to a woodland environment. There are trees that grow in waterlogged areas, like swamps, which need a method of breathing the air they need. They use growths just like this, called something like pneumatophores. (No time to check right now). They are shaped like that and equally ghostly if I remember right. So, I forgive the sculptor :-), but am still asking myself when we can expect the deluge in this park which justifies this crazy thing. Interesting! I like Jo's explanation - perhaps swamp trees were the inspiration for Kapoor's work. Not sure how something can reflect itself but it would be like walking into a Dr Who episode to come across it by chance. love it:)just saw his exhibition in india.did u like it? You have to experience Kapoor's sculptures live, I think – it can be quite startling, when you find the exact point of reflection, you will feel it physically. At least that's how it was with a different piece of him in Munich. I like it! It's a pleasing shape and, although it doesn't look natural, I like the way it reflects the world around it. I'd be interested to see it reflecting itself! Things like this just spoil the park! Meaningless in itself and worse still in the wrong place. Kapoor's work, as most sculpture and art, is made to be experienced first hand and will only be fully appreciated with an open, receptive mind. One of my favourite Tate Modern Turbine Hall installations was Kapoor's Marsyas; the centre of Chicago, in my opinion, is greatly enhanced by his Cloud Gate aka "Bean". At the moment I am struggling with his Orbit sculpture for the Olympic Park but I am happy to have my reservations reversed once it is built and I have experienced it "in the flesh". All these three are site-specific with the first two allowing me to appreciate their surroundings in a new way. 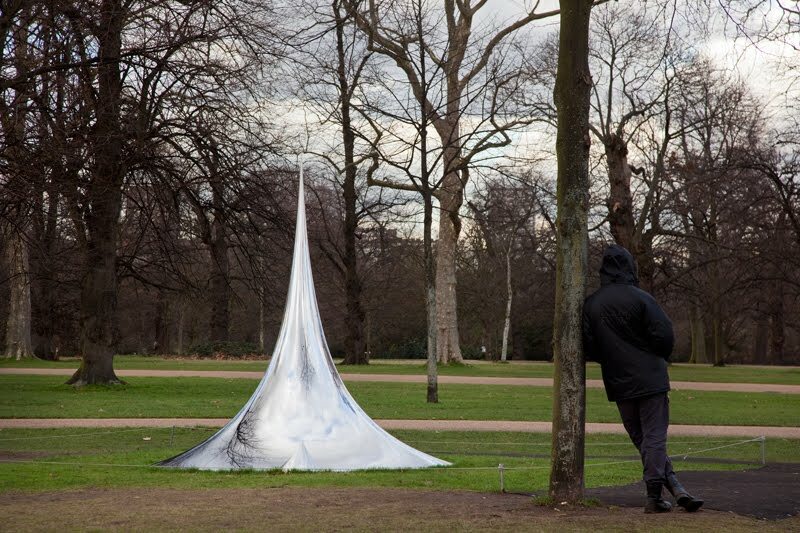 Although not made specifically for Kensington Gardens I think Kapoor's four pieces punctuate my walk through the park in a positive way, particularly C-Curve. Hmmm, I'm hearing more and more about Anish Kapoor. I really need to take a photo walk around London capturing all his works.